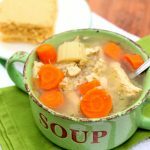 A broth based soup with chicken, celery, carrots and brown rice. This soup reminds me of chicken noodle soup except it has rice instead of noodles. Turn your Instant to the saute setting and add in your chicken broth. The saute setting will start heating up the broth and help the pot come to pressure quicker. Add in the rest of the ingredients. Turn off the saute setting. Cover the pot and secure the lid. Make sure valve is set to sealing. Set the manual/pressure cook button to 18 minutes. When the time is up let the pot sit for 5 minutes and then move the valve to venting. If liquid comes out of the valve move it back to sealing and wait a few more minutes and then try again. Remove the lid. Discard the bay leaf. Shred the chicken or cut it into pieces. Stir the soup. This recipe can be gluten free. Just check the chicken broth to be sure it does not contain gluten. I like heating up the broth in the pot using the saute setting while I prep the onions, carrots and celery. That helps the pot come to pressure quicker. A full pot like this one will take a while to come to pressure. It also takes a while to release all the pressure.